From a young age, Australians are conditioned to apply sunscreen every time they spend time in the harsh, damaging sun. A day at the beach. Playing sport. A walk in the park. If the activity calls for outdoors, we all know that sunscreen is a must. What isn’t such common knowledge, however, is that anyone who steps outside for any length of time – whatever the weather – should also apply sunscreen. Sunscreen is formulated with ingredients that protect skin from harmful UVA and UVB rays found in the sun. Regardless of how hot the sun, how long you’re in it, or how cloudy the day, ongoing exposure to UV rays leads to sun damage that can impact both your skin AND your health. Just running errands in the car? Sunscreen. While the signs of overexposure to UVB rays such as redness, pain, tightness and stinging are easy to spot, UVA damage is a little sneakier. UVA rays penetrate and damage cells at a much deeper layer. Once the signs of sun damage such as wrinkles, sagging and a leathery texture are visible, it’s then generally too late to reverse the damage. Daily sunscreen, regardless of the skin damage you can see and feel, is a must. As with all products you put on your skin and therefore expose your system to, some brands are better than others both for your skin and overall health. Synthetics used to formulate sunscreen don’t always smell pleasant. Synthetic fragrance is often used to cover up the smell of chemicals or to create an emotional attachment for the consumer. The coconut smell we all love because it reminds us of happy times at the beach? Purely a marketing ploy to encourage you to buy the product. Fragrance can irritate sensitised skin, is harmful to your health (LINK) and has no benefits to the efficacy of the product so always choose fragrance-free. While we all know that parabens can harm your health, they’re still legal in small quantities in products in Australia. Check your ingredients and make sure that your sunscreen is free from parabens, your skin doesn’t need them, and neither does your bloodstream. Dimethicone is a silicone that creates an easier-to-apply product and provides a smooth base to apply makeup. Dimethicone doesn’t absorb and therefore creates a barrier on top of the skin trapping sweat, toxins and impurities in the pores. This occlusion can then lead to an increase in breakouts, inflammation and redness. As a synthetic ingredient, dimethicone plays no part in increasing protection from the sun and is entirely unnecessary. The SPF (sun protection factor) of sunscreen indicates how long you can (generally) stay out in the sun for before skin starts to show signs of UVB damage (burning). 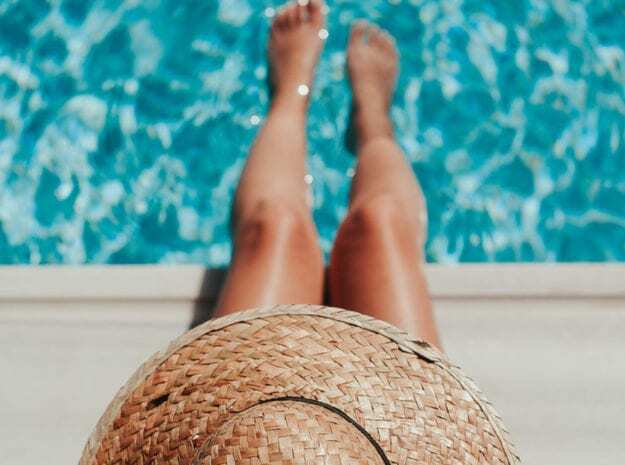 The amount of time you can spend unprotected in the sun before damage occurs depends on your skin type, but 10 minutes would be the maximum for most people. An SPF of 30 would, therefore, provide 300 safe minutes in the sun before you need to reapply. Broad spectrum sunscreen offers protection from both UVA and UVB rays. If your label doesn’t mention both, you may have zero protection from UVA rays which silently damage the cells on a deeper layer. If you have sensitised skin, a physical sunscreen is far less irritating. Rather than help the skin absorb the sun as a chemical sunscreen does, physical sunscreens sit on top of the surface to deflect the UV rays entirely. Physical sunscreens such as zinc oxide may feel a little heavier, but they’re far kinder to the skin. Sadly, there isn’t a sunscreen on the market that completely protects the skin from the sun’s rays. Free radicals caused by sun can harm skin cells leading to dehydrated skin and premature ageing and potentially cancer. The only way to protect against this damage is to use sunscreen in conjunction with anti-oxidant protection. Apply Bd serum before sunscreen every morning. The synergy of natural nutrients gallic acid, anthocyanin and quercetin all work together to strengthen the skin’s barrier to protect against damage caused by free radicals. Bf serum is single-extract of Australian finger lime and is a natural source of plant-based, active and stable vitamin C. Natural plant-based vitamin C not only stimulates collagen production to reduce fine lines and wrinkles and reduce the signs of ageing, but it also offers anti-oxidant protection against free radicals caused by the sun. Not only that, after prolonged exposure to the sun, vitamin C reduces the visibility of sunspots and reduces redness caused by sunburn. We recommend applying Bd or Bf serum under sunscreen* every morning to protect against the free radicals that damage delicate skin cells on a deeper layer. To find out more about how to protect skin cells from the sun, join live chat on the Biologi website, or contact us today. *Disclaimer: Biologi serums may provide anti-oxidant protection against free radicals, but they do not offer protection from the sun and must always be used in conjunction with sunscreen. Thank you for shedding some much needed light on sun protection! It’s so important and we tend to easily forget about these important sun protections factors which include the sunscreens we use & ingrendients! I love using my Bd serum every morning before applying any sun protection! Would also love a list of natural toxic-free sunscreen recomendations too! Are there any particular sunscreens you’d recommend?